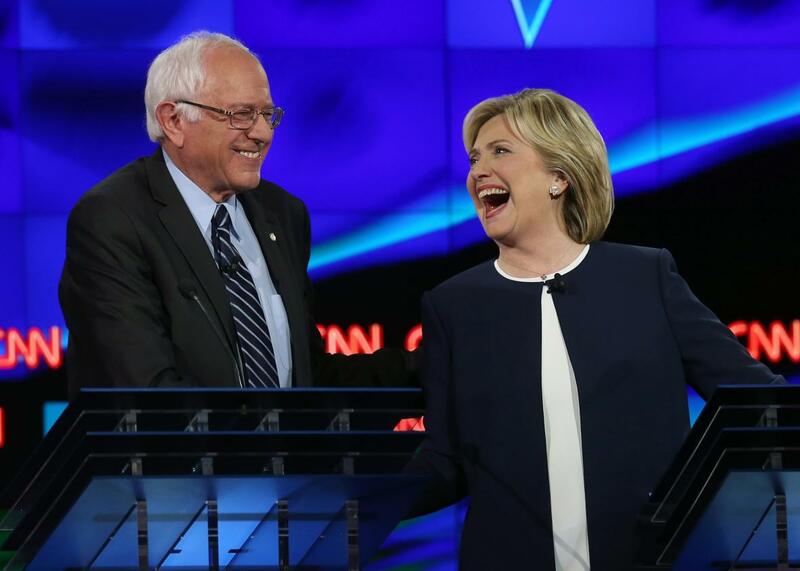 Clinton, Sanders essentially tied in Iowa, New Hampshire. Democratic presidential candidates Sen. Bernie Sanders and Hillary Clinton take part in a presidential debate sponsored by CNN and Facebook at Wynn Las Vegas on October 13, 2015 in Las Vegas, Nevada. With three weeks to go until voters will finally begin to have their say in the presidential nominating contest, Hillary Clinton and Bernie Sanders look set for a photo finish in both Iowa and New Hampshire. Clinton holds a tiny three-point lead—48 percent to 45 percent—over Sanders among likely Democratic caucusgoers in Iowa, according to the latest NBC News/Wall Street Journal/Marist poll. Clinton’s lead is well within the 4.8-point margin of error for the poll. The slim margin between the two Democratic hopefuls is surprising because it’s much smaller than other polls have suggested. The RealClearPolitics average of surveys puts Clinton’s lead in Iowa at 10.6 points. In New Hampshire, where the race has long been more competitive, Sanders is leading Clinton by four points—50 percent to 46 percent. But that is also within the poll’s margin of error. The two state polls “underscore the challenge facing Mrs. Clinton in the first two nominating states, despite her commanding lead in most national polls,” notes the Wall Street Journal. The Vermont senator also does better than Clinton in hypothetical matchups against Republican candidates in both Iowa and New Hampshire. Sanders beats Donald Trump by 13 points in Iowa, for example, while Clinton has an eight-point advantage over the real estate magnate. In a matchup against Sen. Ted Cruz, Sanders is ahead by five points, while Clinton is down by four. In New Hampshire, Sanders’ lead over Clinton in hypothetical matchups is much clearer. Against Sen. Marco Rubio, for example, Clinton loses by 12 points while Sanders leads him by nine points. On the GOP side, the contest is tight in Iowa, with Cruz beating Trump by four points, which is within the poll’s margin of error. In New Hampshire though, things are a bit clearer as Trump holds a 16-point lead over Sen. Marco Rubio—30 percent to 14 percent.